In late April of 2016, just before construction was scheduled to begin on our second story addition, we found out we were expecting baby number three for the new year! Our twins were about to turn one, and between plans with them and construction on our home we had a a jam packed Summer ahead, so we knew we had our work cut out in a very short span of time! The addition on our house was going to add two more bedrooms (for a total of 4) and one more bathroom (for a total of 3), and now we needed this space more than ever! 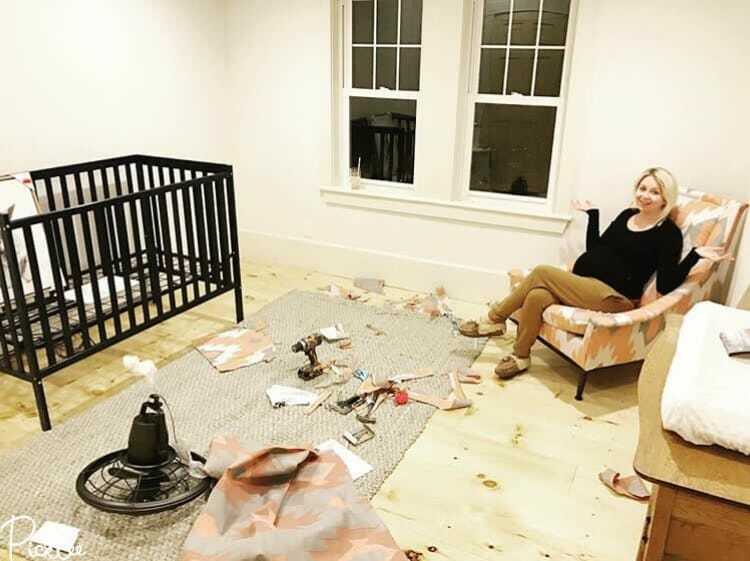 The addition on our home wasn’t scheduled to finish until late November (just a month before baby #3 would arrive), so that meant all nesting and nursery set up would be crammed into just a few weeks span! 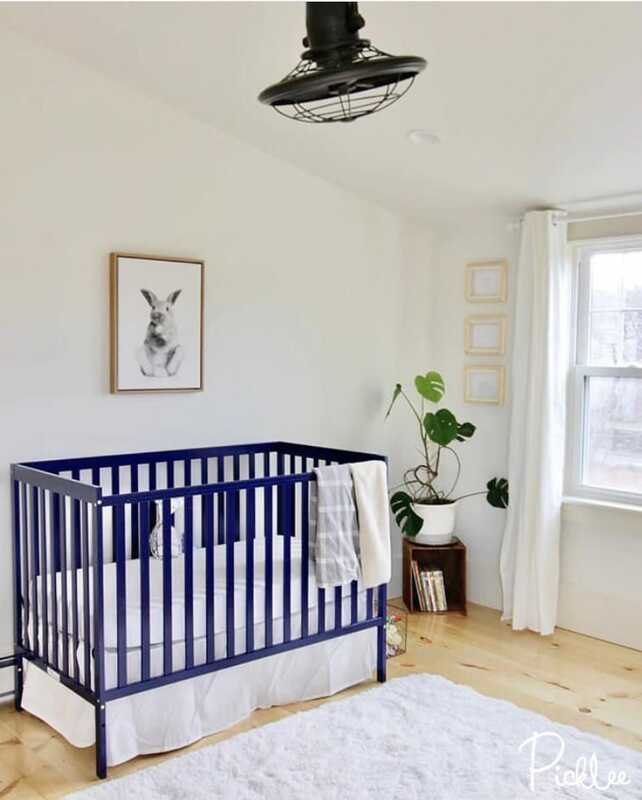 I have to admit, due to the time crunch, our busy schedule with the twins, and the construction, I did not put a whole lot of planning into our baby boy’s nursery…but I knew I wanted it to be minimal, white, and a bit boho. Believe it or not, we already owned just about all of the furniture and decor I would use for his nursery (the exception being his crib), and I love nothing more than reusing and repurposing things I already own, so it ended up costing under $200 (plus the cost of the crib) to complete everything! On January 11, 2017 baby Harrison Grey came into our wild & crazy world, and I had finished up his nursery just the week before! Since our time was so tight, I really improvised just about everything as I went along, and I absolutely love how it turned out! The biggest difference between Harrison and the twin’s nursery is the absence of useless contraptions and toys. Since the twins were my firsts, I bought all the usual baby gear which I would later learn was a waste of money and time! 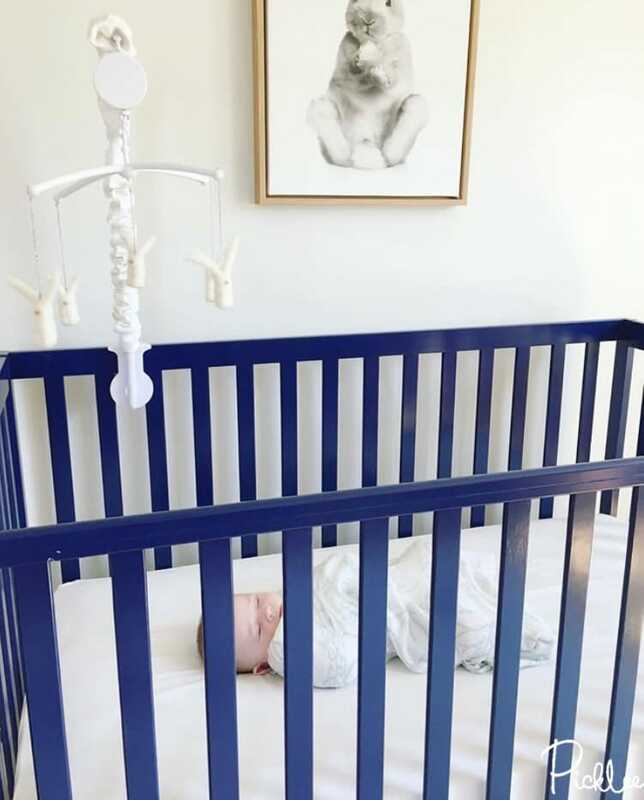 Babies truly don’t require many contraptions for their first year…they thrive on milk, love, attention, lots of positive interaction with loved ones, and of course-a few toys here and there. Having twins first, we quickly learned that our children’s boredom was directly correlated with how large their toy collection grew-the more they had, the less they wanted to use them! 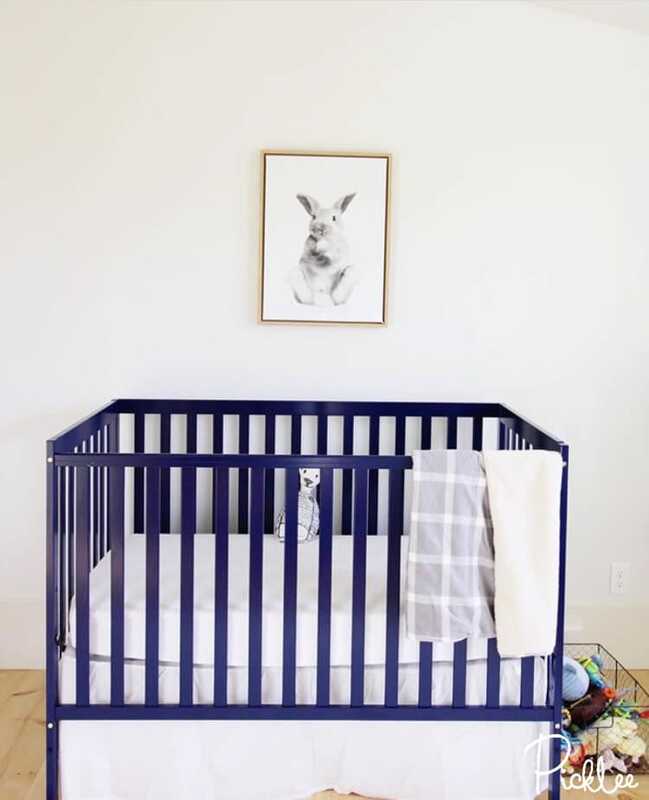 The first purchase I made was his navy blue crib, which I snagged for less than $150! 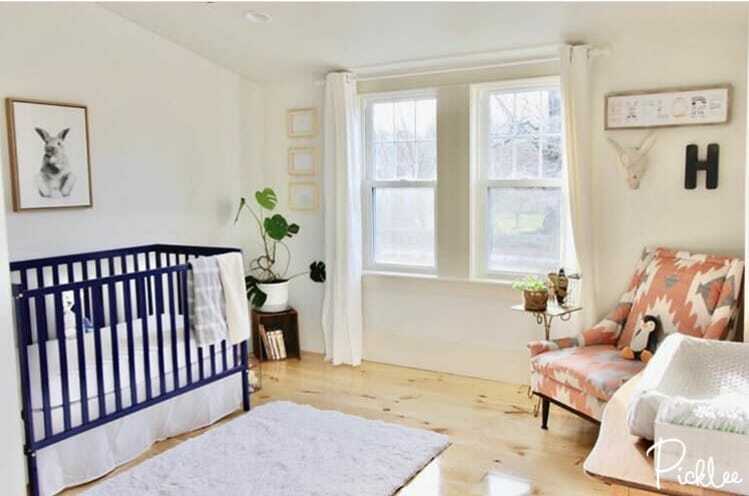 Since his crib made a bold statement on its own, I went very clean and minimal with mostly everything else. I decided to incorporate black and white art in natural wood frames with lots of white space to bring out the lines and detail. Moving along to the must have in every nursery, a comfy chair! Countless pieces of furniture have entered and left my home over the past several years but this mid century modern beauty has stuck. I’ve re-upholstered it 3 times since I purchased it for $15 in 2012 , and so far this print is my favorite by a landslide. 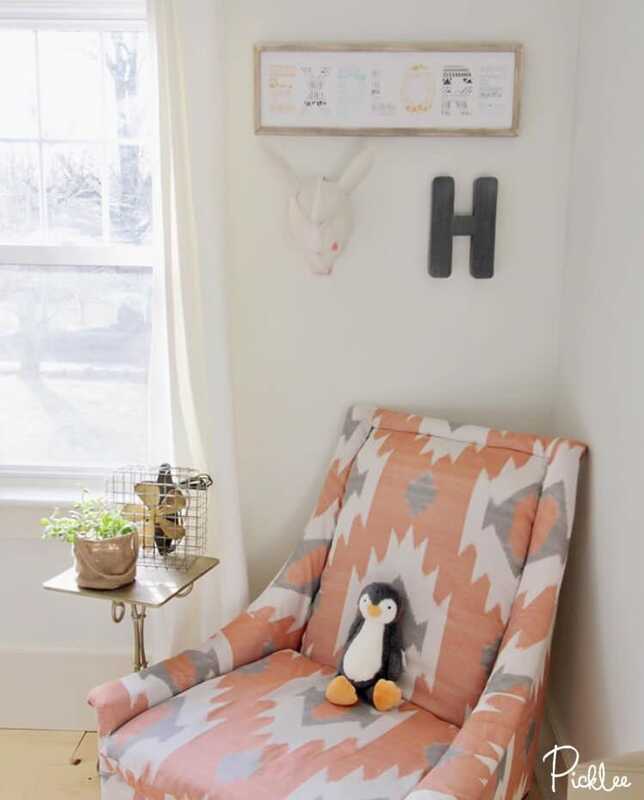 I picked up a gorgeous peach aztec print and gave my mid century modern chair a facelift fit for a nursery! We already owned the gold side table and vintage fan, it just took a bit of trial and error and basement browsing! Above the chair, I hung a few sweet & simple finds. Here I am 3 weeks before Harrison’s arrival, after completing my masterpiece; which was by far my most exhausting upholstery job to date…only because the body just doesn’t cooperate the same at 37 weeks pregnant! Harrison’s “changing table” was another piece we had stored away in the basement. I purchased the antique oak chest of drawers a couple years back at a thrift shop for around $20! 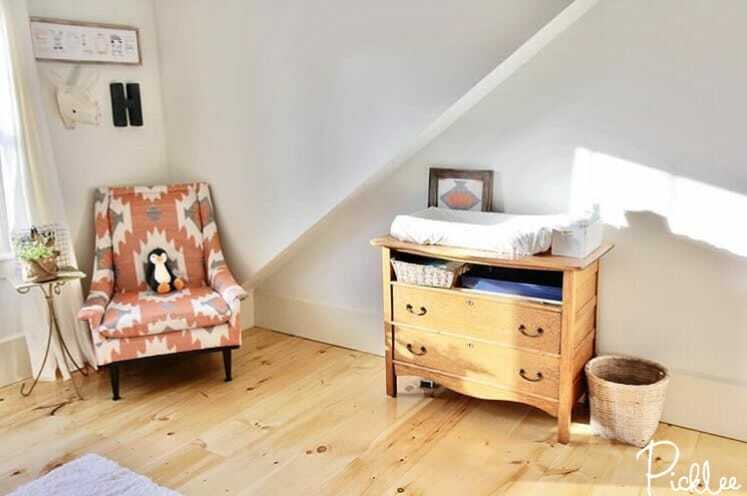 To turn it into a changing table, I simply removed the top drawer and inserted a slim piece of wood…then we added a basket and tray with diapers etc. When we were building our addition, I paid special attention to the closet design. I’ve never liked the look of bulky furniture overtaking a room, so I designed the closets with shoe shelves and built in dressers (Koppang style purchased from Ikea!). We simply painted everything to match the trim color after it was built! 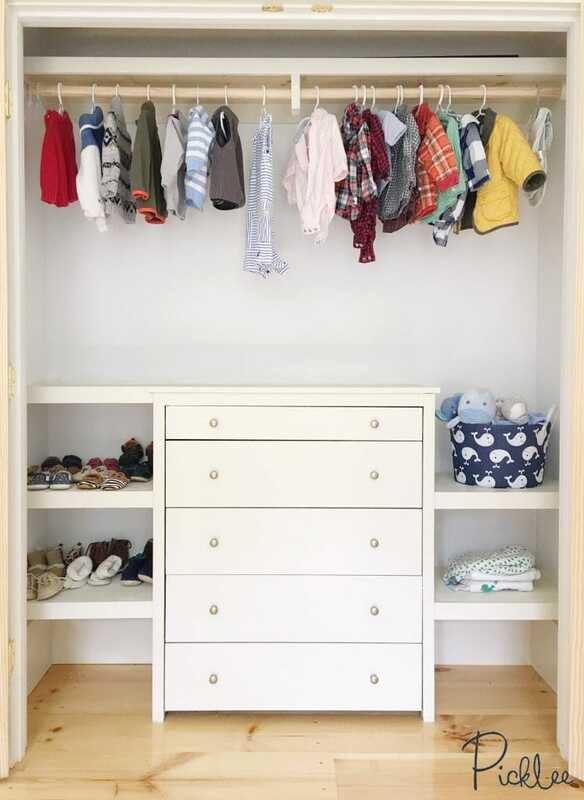 This was one of the best decisions we made, especially with kids, as it keeps clutter and clothes behind closed doors at all times! Last, but not least, to incorporate a personal touch, I added a few of Brett’s drawings. Brett is by no means an artist, but over the years he’s drawn me a handful of goofy characters that we’ve grown to love…so I asked him to draw them in simple black and white. 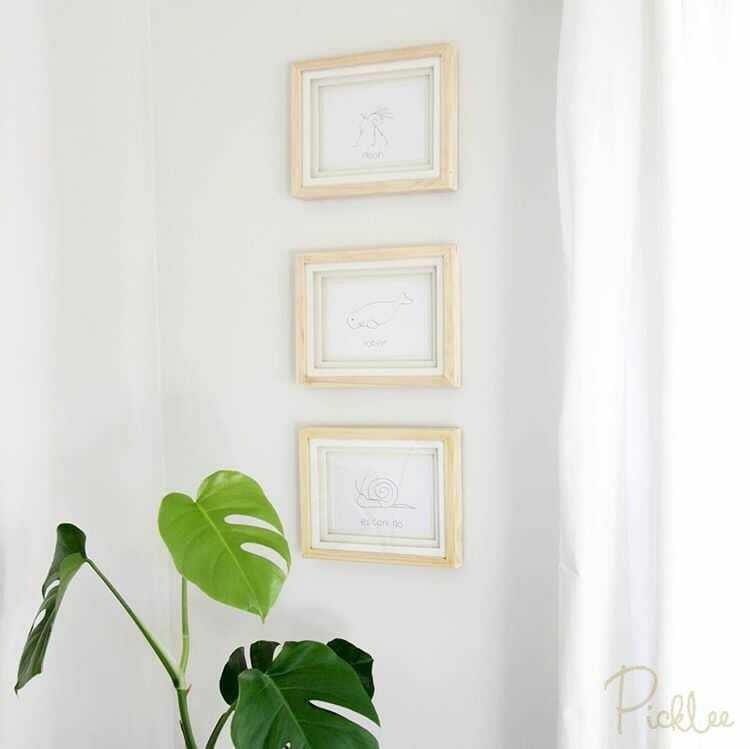 I then matted & framed them in simple unfinished wood frames and hung them in a prime location above our favorite Monstera Deliciosa (Swiss Cheese plant)! 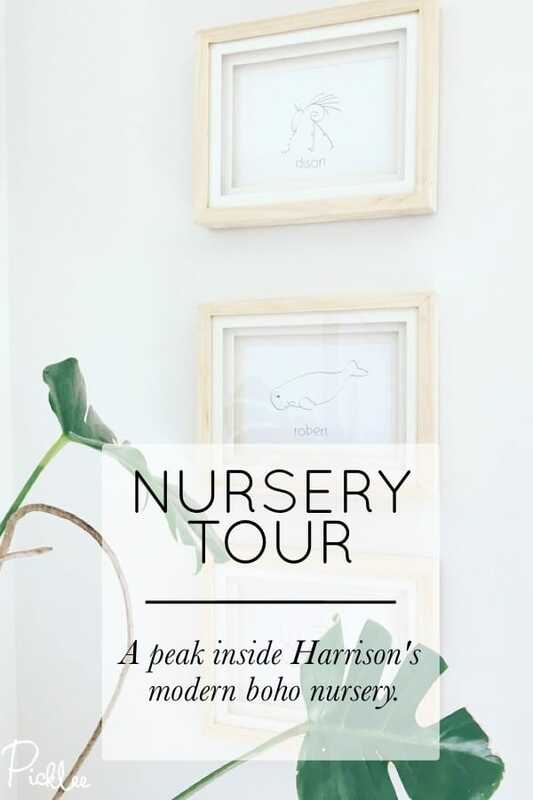 That just about completes Harrison’s nursery tour! Oh, can’t forget the icing on the cake-sweet baby Harrison Grey peacefully enjoying his new space! I love all your ideas! May have to pick your brain when I start refinishing some old pieces I have! Jordan you are very talented. I don’t know how you have the time or energy.